Author’s SOF-TT, SWAT-T, and C-A-T tourniquets. There was an officer-involved shooting in the City of St. Petersburg last week. In the exchange of gunfire, an officer was hit in the leg by a bullet from the suspect’s pistol. Unfortunately, the officer’s Combat Application Tourniquet (C-A-T®) was in his cruiser. He attempted to fashion a field-expedient tourniquet from a garden hose to help staunch the flow of blood. I am glad to report that he survived. The suspect did not. This shooting caused SPPD to examine their issuance of the C-A-T tourniquet. Some officers complained that the C-A-T is difficult to carry on a crowded gun belt. SPPD Chief Tony Holloway, in turn, approved the purchase of the SWAT-Tourniquet, or SWAT-T, which is essentially a flat elastic band that folds into a very small package. In St. Pete’s case, the SWAT-T’s will supplement the C-A-T’s that the officers are issued. Currently, I have a C-A-T, a SWAT-T, and a third type, the SOF® Tactical Tourniquet. The SOF@TT is a windlass style of tourniquet, which is manually tightened with a rod, as is the C-A-T. My C-A-T was department issued. I bought both my SWAT-T and SOF®TT. I have practiced with each one and I have a few thoughts. My C-A-T is the one I carry on Patrol and, despite that fact that is issued, I would still wear it out of personal preference over the other two. My experience is that the C-A-T is the easiest of the trio to apply to oneself. Each tourniquet will absolutely do the job, but when you have only a minute or two to save yourself from exsanguination, the simplest one to get on is the best. I always plan for the worst-case scenario. If I had to apply a tourniquet with just one hand, I find the C-A-T can be pre-loaded to slide on an extremity and be tightened with either arm reliably. The SOF®TT is similar to the C-A-T, but a bit more complicated with its clamping hardware. 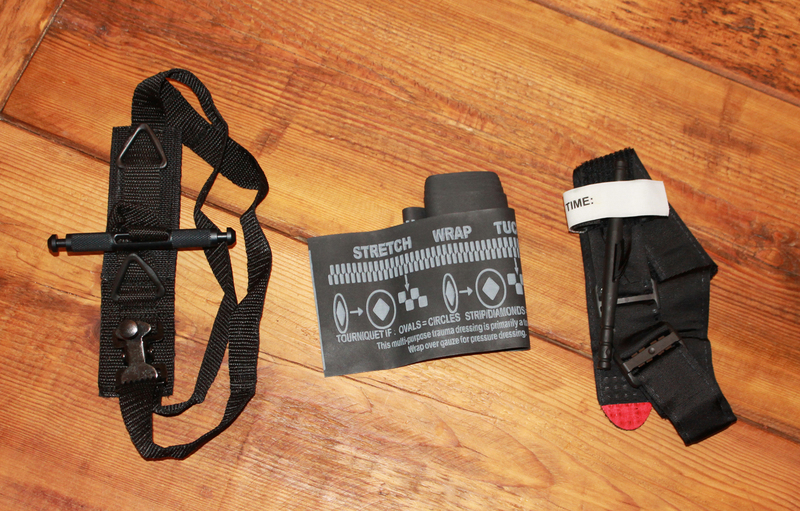 The SWAT-T is, frankly, hard to get started on an arm or leg with its first wraps. These are my opinions, so if you disagree and like one of the others then I think you should use what works for you. In our yearly TCCC training, our instructor stressed to practice, practice, practice with your tourniquet to make sure you can effectively don it during stress. He also urged us to take everything out of their sealed packages to know how they worked before they are needed. As I have written before, when in the blue suit, I carry my C-A-T on my left ankle over my boot with a T.U.C.Rig hook and loop strap. The tourniquet is accessible with either hand and comfortable to wear. One our detectives carries hers in this manner in our business casual wear in CID. I see some of our patrol officers with C-A-T belt holsters. Still others affix them in the straps of their ballistic vests. I am thrilled law enforcement is having this discussion about tourniquets. Decades ago, an officer friend of mine was shot in the femoral artery and bled to death at the scene. He might have been able to self-rescue and mitigate his extremity hemorrhage if he had a tourniquet. I won’t put on the uniform without strapping mine on. It could save me, another officer, or a citizen. It is that important. This entry was posted in Medical, Officer Down, Officer Safety, Street and tagged Officer Safety, Tourniquet for Police. Bookmark the permalink. please; I suspect the majority for people wanting the issuance of TQ’s are responding to “marketing” ‘forces’. Personally I love the police; they are difference between an orderly society and social breakdown. Anything that helps a police officer be better prepared, better protected or better equipped will always win my support. But TQ’z that is just a waste of money and in my opinion anyone spending resources like time or money to promote such a ‘essential’ bit of kit, needs to seriously “review” how they evaluate what duty officers realistically ‘need’. I myself thank all “on-road” ‘in-harms-way’ officers for their service and I am sorry you get so much “grief” from those whom you serve. I am sorry you are often at serious risk and work for such lousey pay and if i thought a TQ would improve your life I would be all for it, but really what I might possibly help how many officers ? Why not campaign for more range time or more officers or better communications; whatever else would actually help and assist officers to do their duty. If we really wnat to “protect” officers then i think all serving officers should have duty uniforms made out of ‘kevlar’; as in the “whole” uniform. Where do you draw the line at how much “stuff” an officer can cart around and how useful that ‘stuff’ is realisitically going to actually turn out to be to officers. But in todays legal world, if the “boss” ‘issues’ you with a TQ you had better have it on you, because for a few bucks they become ‘almost’ “judgement proof” if an officer gets shot in the field and ‘bleeds out’. Simply put it would be up to the officers family to prove they could not “self-rescue”. Trust me when i say i have seen the “effects” of people calling for ‘stupid’ equipment, i used to work as a Paramedic and our boss actually issued the entire service with GAS MASKS; complete with BOTH a ‘respiratory’ filter and a NUCLEAR BIOLOGICAL CHEMICAL warfare filter (good in storage for ten years). Really some things are a waste of time and tourniquets are just a waste of money. Greg, I could not disagree with you more. While I appreciate that you have some ideas about how to help us, full Kevlar uniforms and better communication do not solve the issue of over a half million criminal assaults on police officers each year. We are lucky as few officers die as are tallied at year’s end, but thousands of wounded officers are saved by modern medical practices. Extremity hemorrhage and tension pneumothorax are two types of trauma that kill, but can be managed at the scene and until BLS and ALS are available safely. I’ll stick to wearing my tourniquet, thanks. Randall, it is OK; truly if you “wear the uniform” then believe me you are entitled to hold any reasonable opinion you want. I was fairly sure you would not agree with my ‘comments’ but you have every right to have your opinions when they differ from mine. Honestly i “thank you for your service” and i doubly tripely thank you for be a part of raising the awareness of what LEO’s need and go through. Anyone who is prepared to go through what Officers go through for strangers and society deserve far more than they get. Society’s “bodyguards” need all the help and respect they can get, again thank you for all you do both professionally (at ‘work’) and personally (at ‘home’) and at this great website; thank you !!! Thanks for the kind reply, Greg.